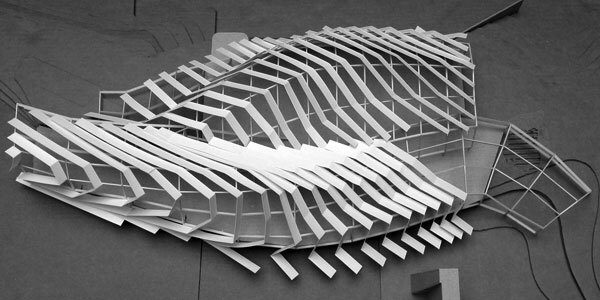 Germinating in the practicum studio of the University of Cincinnati’s architecture department, a group of students proposed designing a boathouse for the women’s varsity and men’s club teams. As professor of the studio, Michael McInturf carried the original idea of the project into his private practice and allowed it to grow within critical practice. The theoretical position of the design began with the student’s study of the rowing stroke and developed through his practice into a comprehensive investigation of the physiology and mechanics of the rowing cycle. The design developed through multiple explorations in sketches, physical models, computer models and animations. The model began as a singular expression of the rowing cycle as it relates to the pulse of energy generated during the cycle. This diagram is characterized by two curves, each describing individual aspects of the rowing cycle. This initial diagram was then animated through multiple instances and attached to the site where it found itself adapting to the landscape and the site forces inherent on the property. These site dynamics contributed significantly to the development of the building. Physical and theoretical constructs such as flooding sequences, topographic edges, movement patterns and abandoned bridge piers.